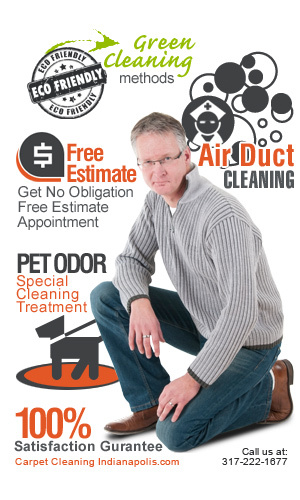 Carpet Cleaning Indianapolis | Carpet Cleaning Services And Much More! 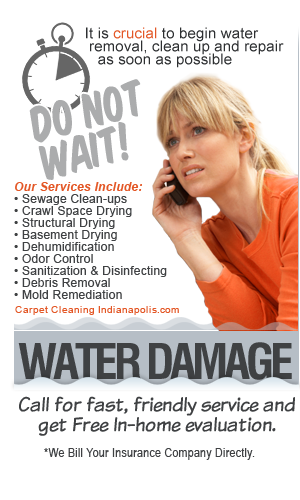 Carpet Cleaning Indianapolis is proud to help the citizens of Indianapolis in any water damage restoration following the tornado that hit the town last week. 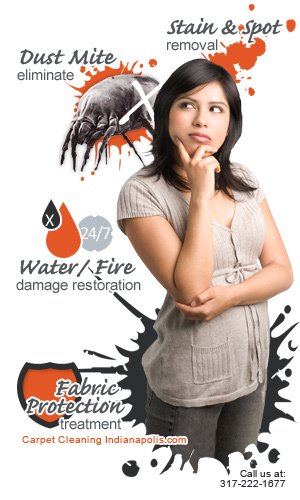 We offer special rates for all water damage restoration services starting as low as $199. We are fully bonded and insured and working with the best water damage and restoration equipment available. Call us at 317-222-1677 for further details. Carpet Cleaning is one of our leading services provided by the best professionals trained and experienced in rug cleaning, upholstery cleaning, air duct cleaning and other house cleaning services. Customer satisfaction is our motto! An improperly cleaned carpet is the cause of allergies which lead to breathing problems like asthma in the later stages. Our carpet & upholstery cleaning service promises a 100% dust and dirt free carpet after our service. Our system of cleaning is proven safe for children and pets and utilizes green care products for a safer much healthier environment. Indianapolis Carpet Cleaners utilizes only the latest superior quality products and equipments for carpet stain removal that includes truck mounted carpet cleaning devices that removes the dirt and dries the carpet in a very short time without causing any ill-effect in the customers. Carpets can be used immediately after our service. There are many different methods in dealing with dirty carpets and upholstery. Our technicians are experienced in all of them and will inspect your carpets and recommend the most suitable method for your fibers, stains and budget. When our Carpet Cleaners use carpet dry cleaning an absorbent cleaning method. Dry absorbent compound is sprinkled over the carpet with a sprinkler. And then we use a rotary agitation machine to further deepen the compound. The absorbent compound contains water, carrier, detergent and a solvent. After about 15 minutes the substance will encapsulate the dirt and soil. Then we will vacuum the carpet and groom it as you will see the results are outstanding with this quick, reliable cleaning method. The hot water extraction method also known as carpet steam cleaning has been proven as the most efficient method of cleaning carpets. It is superior to dry cleaning and many others as they are not sufficient in removing dirt and odors that tend to stick to your carpets and upholstery and just won't come off with carpet steam cleaning we pre-spray a cleaning solution to break up the soil and dirt and then we dispense hot water into the carpet and immediately extracting the dirty residue lurking in the bottom fibers of the carpets. Your carpet will dry in up to 2-4 hours. 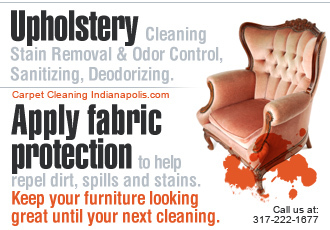 By hiring Indianapolis Carpet Cleaning you are making sure that your carpets will be handled by trained professionals with thousands of hours of experience in handling the toughest stains and providing service for even the gentlest fabrics we only use the most advanced machines to make sure you get the best cleaning results. It is highly recommended to professionally clean your carpets at least once a year depending on how much traffic hits the carpet and also if you have pets or small children in your house as infants are very sensitive to dust mites and allergies.Do not risk your health contact Indianapolis Carpet Cleaning as soon as possible. We offer the latest technology in hardwood floor refinishing and the scientific process to make your wood floor to be wiped off these deep stains and spill marks. Our experts can also advise you on the best possible solution to keep all these sticky stuff away from your adorable wood floors. Our efficient system can be operated by one person and it is the most effective machine available on the market. We don't incorporate any chemicals to clean the air duct as we value our customer's health. For more relevant information regarding our quality air duct cleaning service visit our air duct cleaning web page. Carpet Cleaning Indianapolis great service is backed up by our Satisfaction guarantee which means that if you are not 100% satisfied with our service. We will clean your carpet or any other service free of charge. Our technician on his arrival to your premises will first demonstrate our products on a little area of hard to clean stains and then let you see for yourself just how marvelous the results are then we can begin cleaning and grooming your carpets. If you have any concerns on any of our services please call us at 317-222-1677 we will love to respond to any of your questions.